After working so hard to fine-tune your skills, now is the time to start thinking about showing the rest of the world what you’re made of. You may be putting the finishing touches on a project or getting ready to dust off your degree. Or you may have discovered a new passion that has you prepared to invest your time and energy into. The Eight of Disks has been called the “apprenticeship card.” It refers to finding your personal labor of love and devoting yourself fully to it. It’s the precarious balance of passion and discipline, as you hone your craft to perfection. You may be making a pivotal move toward achieving what it is your really want to achieve. Look at the imagery in this card. 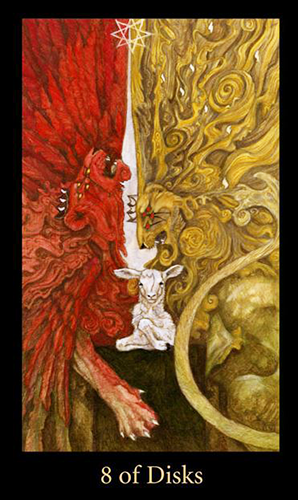 There are a set of lions — one red and one gold — framing a delicate lamb. They rise up on either side like pillars of strength and virtue, leave little room for error. It takes focus, determination and preservation (notice the lamb so peacefully situated between the two pillars) to achieve this level of mastery. Ask yourself; are you protecting the lamb or are you preparing to devour it? The desire to hold on to your work may be just as compelling as the need to set it free. The symmetry here, along with the 8-pointed star at the apex, serves as a reminder that balance, harmony and synchronicity are all important features of this process. Keep this in mind as you work toward manifesting your goals. Whether you do so quietly or you do so loudly, it’s up to you to DO something. Take action, make a move and stop seeing things in black and white. You don’t want to be sitting there frozen in place and unable to move indefinitely. Today’s tarotscope — Eight of Disks — is part of the Mary-el Tarot series by Marie White, published by Schiffer Publishing. Used by generous permission. Original art, as well as full-sized prints, are also available on her website. Please check out and “like” this deck’s Facebook Fan page.